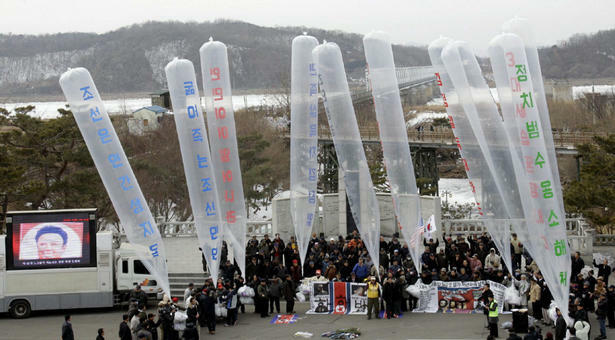 South Korean activists and former North Korean defectors release balloons with leaflets condemning North Korean leader Kim Jong Il during a rally on Feb. 16, 2011. …sent tens of thousands of helium balloons towards the North Friday, packed with messages detailing the popular uprisings in Egypt and Libya and explaining that “a dictatorial regime is destined to collapse,” according to news reports. The helium balloons are able to travel up to 200 km, taking them into the heart of North Korea where they burst, spraying their cargo below. Along with leaflets, the balloons carry rice, medicine, clothing and radios in baskets tied to them. In response, the North Korean government has condemned the launching of these balloons as an act of “psychological warfare,” and is threatening armed retaliation if they do not stop. While I’m all for promoting nonviolence to the people of North Korea, I think that activists or civil society groups would be in a better position to deliver that message than the South Korean military. Nevertheless, I’m glad someone is making the effort and hope that North Koreans take inspiration from the nonviolent movements that are toppling repressive regimes in the Middle East.